Light & Darkness Radio: Featured Today! "Porcupine Tree,Leaves' Eyes..."
Leaves' Eyes (DE) - Their newest album "Meredead" been on rotation on L&D for a week and is one of the most played bands of the week this is why is a "Featured band" not only of the day of the whole wee/month! ~ In 2011, the most international band in the world released “Meredead”, and once again reclaim the coveted spotlight that will place them at the pinnacle of the symphonic- rock and metal genre. With “Meredead”, Leaves’ Eyes opens a new chapter of Nordic mythology. Their latest masterpiece frees them from all past genre restrictions, allowing them to evolve into a rocking, contemporary, and more enthralling force than ever before. As made evident by the debut album “Lovelorn” (2004), Leaves’ Eyes came into being during a walk in the woods. The musicians are able to convert nature’s impressions into music in an incomparable way. Thorsten Bauer and Mathias Röderer established an exceptional guitar sound with the first album that has been a band trademark ever since. However, it is Liv Kristine’s unique voice that serves as the linchpin in Leaves’ Eyes. On “Lovelorn”, Liv sings about a magical world filled with mermaids, love and tragedy. With this concept album, the band not only enthralls the ears, but in particular the imagination of the listener. The members of Leaves’ Eyes do not merely write songs, their music tells of sagas and legends. Like no other newcomer band, Leaves’ Eyes received exceptional feedback and coverage from the press (including interviews and cover stories). The fanbase continued to grow within a matter of weeks until the numbers filled the hall of the Wave Gotik Treffen 2004, celebrating the band’s stage premier. The spectacular and rapid success of Leaves’ Eyes does not happen without a reason. Every band member had already been gathering professional experience in other musical endeavors for years before joining Leaves’ Eyes. In the mid 90s Liv Kristine’s voice was like a beacon in the gothic scene, while singing for Theatre of Tragedy. The Norwegian band established the marriage of Metal with the female voice, and their club hit “Tanz der Schatten” became synonymous with the direction and expression of a whole musical genre. In addition, Liv Kristine conquered the pop scene and sang the songs to TV hits like “Tatort” and “Schimanski”. In Leaves’ Eyes, Liv is supported by the band members of Atrocity. The metal heavyweights recently earned top honors for being the “most diverse Metal band”. With each and every album, Atrocity sets landmarks. This can be Death Metal (“Todessehnsucht”), “Electro (“Die Liebe”) or epic music “Calling the Rain”). Their series of “Werk 80” albums is a legend of its own and skyrocketed the band into higher chart positions (e.g. position 19 for “Werk 80 II”). Liv calls the members of Atrocity “the best musicians and friends in the world”, having the perfect partners at her side. One year after “Lovelorn”, Leaves’ Eyes made waves with the follow up “Vinland Saga” (2005). The single “Elegy” stays four weeks in the German charts. The elaborate animated video clip was broadcasted by TV stations all over the world and is the adaptation of the album’s concept, which deals with the Viking Leif Eriksson. PRO7 used “Elegy” as the official song for the series “NUMB3RS”. Like the classic composers, Leaves’ Eyes turn legends and tales into songs. The music on “Vinland Saga” invokes the mighty forces of nature and the fighting Vikings in the mind of the listener. Once again, Liv Kristine’s love for heir native Norway shines throughout the compositions and it is clear that her band cohorts also long for the magic this country has to offer. Leaves’ Eyes is not just a studio band, despite numerous chart entries. They play live shows on a regular basis and traveled all over the world to bring their music to their dedicated fans. Since “Lovelorn”, it seems like the band has been on tour forever. In only four years, the band traveled through four continents, 34 countries and played 222 concerts. Fans from South America, North America, Australia, and Europe prove that a love for music transcends all borders. This comes as no surprise, as the band comprises members from Germany, Norway, and North America. The Live DVD “We Came With the Northern Winds / En Saga I Belgia” (2009) entered the German DVD charts at number 11. This exclusive package documented the exceptional history of the band. In addition, the DVD features the legendary concert at the Metal Female Voices Festival 2007. This headline show presented the fans with an impressive Viking longship on stage. “Njord” continued the triumphs of the band. 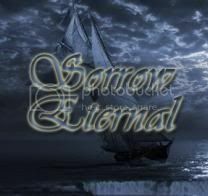 The album’s first single “My Destiny” soon became the successor to the anthem “Elegy”. Liv Kristine may sing “I’m falling into the deep”, but she truly aims for the stars. “Njord” was praised by fans and critics alike as an epic masterpiece and made it to the top 30 of the German charts. One again, the musicians had let go of the conventional to reinvent themselves. More complex and characteristic than ever before, yet modern and unpredictable, the album took the listener by surprise. Leaves’ Eyes perfected the union of classical and metal with the help of the Lingua Mortis orchestra directed by Victor Smolski. The English traditional “Scarborough Fair”, as well as the Irish, Old English, French, and Norwegian lyrics explored the yet undiscovered territories of their unique musical landscape. The band’s live performances were as equally successful throughout Europe and North America as their studio effort. Only one and a half years later, Leaves’ Eyes releases their fourth studio album and delivers their most impressive work thus far. “Meredead” may well turn out to be the most important album in the band’s history. With a top-notch production by Alexander Krull, Leaves’ Eyes have come close to achieving perfection by combining all their best qualities. The epic feel of “Njord”, the direct approach of “Vinland Saga”, and the unique folk touch of “Lovelorn” come together on “Meredead” to create this masterpiece. “Meredead” unleashes a tidal wave that will leave the music world breathless. The opening number, “Spirits’ Masquerade” impressively showcases the endless possibilities inherent in the symphonic metal genre. More than ever before, folk instrumentation refines the album’s varied sound. The epic tracks, “Étaín” and “Sigrlinn”, lyrically recount the mysticism of past cultures and are supported by uileann pipes, which also catapult the listener into this very magical world. Liv Kristine’s first-class vocals on the more traditional songs, “Nystev” and “Kråkevisa”, lead the way to her Norwegian homeland. The latter makes use of the Scandinavian nyckelharpa, or keyed fiddle. The flawless rock song “Velvet Heart” walks a fine line between clear structure and epic atmosphere. With the chilling new interpretation of “To France”, Leaves’ Eyes evokes the tragedy and emotion of Mike Oldfield’s classic track. Leaves’ Eyes, along with a choir and an army of guest musicians, delivers top-notch entertainment. Maite Itoiz and John Kelly (Elfenthal), Carmen Elise Espenæs (Midnattsol), the Norwegian Anette Guldbrandsen, and Viktor Smolski’s brilliant Lingua Mortis Orchestra serve to further enrich this masterpiece. Yet, Leaves’ Eyes has always offered more than just a musical broadening of the horizon. Liv Kristine’s use of Old English and Norwegian lyrics narrates fascinating sagas, bringing the listener even closer to a long-forgotten era. Whether a gentle ballad or an opulent opus, the tracks are direct and to the point. With the band’s strength and courage, as well as an unorthodox variety, Leaves’ Eyes has unequivocally reinvented itself. Refusing to be categorized, Leaves’ Eyes dictates its own direction, and with “Meredead” ultimately achieves symphonic metal perfection. Kill the Romance (FIN) - An amazing band in constant rotation on L&D don't forget to request it! 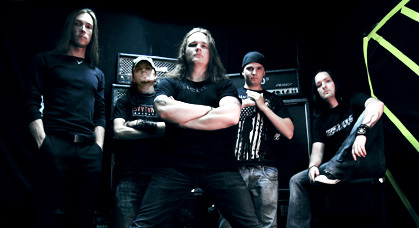 Kill the Romance was founded in Finland in the beginning of the 2004. The band performs diverse modern metal and delivers aggressive songs blended with catchy melodic parts. In July 2004, the band recorded their first self-entitled EP which got some great reviews from all over the world. Self-entitled EP was good enough to convince the Finnish metal “agents” and Kill The Romance was chosen from over 150 unsigned bands to play in the first Finnish Metal Expo happening. In June 2005 Kill the Romance released their second 4-track EP called “Logical Killing Project”. Once again, the press liked it and “Logical Killing Project” gained a good amount of “demo of the month” nominations in different magazines and webzines. After the release the band toured heavily in Finland and played eg. in Tuska Open Air metal festival and Nummirock metal festival. In 2006 Kill the Romance released their third EP called “Cyanide”. “Cyanide” was chosen to “demo of the month” in biggest Finnish music magazine Soundi. In same time Kill The Romance was also chosen from hundreds of demo bands to play in Wacken Open Air Metal Festival's bands battle final in Finland. In fall 2006 Locomotive Records inked a deal with Kill the Romance. Debut album "Take Another Life" was released in Europe and USA in March 2007. After the release Kill the Romance toured in Finland, Germany and Switzerland. In March 2010 Kill the Romance started to record their second album. The album called "For Rome And The Throne" will be released in March 23th 2011 via Inverse Records. "For Rome And The Throne" is definitely the most diverse in group´s history. Aggressive and heavy songs blended with catchy melodies are now flavored with some keyboard layers and acoustic parts to give some depth. "Feel free to drop a request via email or blog shoutbox or Facebook post. All featured bands are selected via "Most" played/requested on the day/week so request your favorite band so it can be a "Featured Band".